New Delhi: Nearly 1.5 lakh Sub-Centres and Primary Health Centres would be transformed as Health and Wellness Centres by 2022 under Ayushman Bharat to provide comprehensive and quality primary care close to the community while ensuring the principles of equity, affordability and universality. Ayushman Bharat is a centrally sponsored programme anchored in the Ministry of Health and Family Welfare. It is an umbrella of two major health initiatives, namely Health and Wellness Centres and Pradhan Mantri Jan Arogya Yojna. Delivery of comprehensive primary health care services through Health & Wellness Centres is a critical component of the newly-announced Ayushman Bharat scheme. It places people and communities at the centre of the health care delivery system, making health services responsive, accessible and equitable. Till date, 4,503 HWCs have been operationalized in various states, official data of the year gone by showed. Additional Human Resource – New cadre of health care professional- referred to as the Mid-Level Health Provider- who is a nurse or an Ayurvedic Practitioner trained and accredited for a set of competencies related to primary health care and public health. Mid-Level Health Provider will lead the team of MPWs and ASHAs at SHC level. The package of services envisaged at Ayushman Bharat-Health and Wellness Centres are care in pregnancy and childbirth, neonatal and infant health care services, childhood and adolescent health care services, family planning, contraceptive services and other reproductive health care services, management of communicable diseases including National Health Programmes, Management of common communicable diseases and outpatient care for acute simple illness and minor ailments. 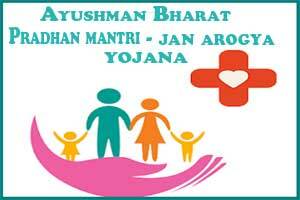 Pradhan Mantri Jan Arogya Yojana (PMJAY) aims to cover over 10 crore poor and vulnerable families (approx 50 crore beneficiaries) providing coverage up to Rs 5 lakh per family per year for secondary and tertiary hospitalisation. PMJAY has been launched on September 23, 2018. After the launch of PMJAY, RSBY and SCHIS got subsumed in it. It is an entitlement based scheme. This scheme covers poor and vulnerable families based on deprivation and occupational criteria as per SECC (Socio-economic caste census) data. PMJAY provides cashless and paperless access to services for the beneficiary at the point of service in any (both public and private) empanelled hospitals across India. All beneficiary families of RSBY and SCHIS are entitled for benefits under PMJAY. Under PMJAY, the states are free to choose the modalities for implementation. They can implement the scheme through the insurance company or directly through the Trust/ Society or mixed model. At National level, National Health Agency (NHA) in the form of Society has been registered under the Societies Registration Act, 1860, to implement the scheme. NHA is responsible for all operational matter of PMJAY. NHA is functioning with effect from May 11, 2018. A MoU has been signed between National Health Agency, Government of India and 31 states, UTs namely, Uttar Pradesh, Andaman & Nicobar Island, Lakshadweep, Dadra & Nagar Haveli, Daman & Diu, Chhattisgarh, Mizoram, Jharkhand, Bihar, Puducherry, Madhya Pradesh, Assam, Haryana, Uttarakhand, Jammu & Kashmir, Manipur, Meghalaya, Gujarat, Himachal Pradesh, Chandigarh, Tripura, Nagaland, Arunachal Pradesh, Sikkim, West Bengal, Rajasthan, Goa, Maharashtra, Tamil Nadu, Karnataka and Andhra Pradesh. Out of these 31 states, Union Territories, 25 states/UTs namely Arunachal Pradesh, Tripura, Chhattisgarh, Mizoram, Manipur, Gujarat, Nagaland, Sikkim, West Bengal, Dadra & Nagar Haveli, Himachal Pradesh, Tamil Nadu, Daman & Diu, Haryana, Jharkhand, Assam, Uttar Pradesh, Chandigarh, Maharashtra, Uttarakhand, Goa, Bihar, Lakshadweep, Madhya Pradesh, Andaman & Nicobar have launched PMJAY on September 23, 2018. Ayushman Bharat National Health Protection Mission Council, as an apex body has been set up to provide policy direction to the scheme. More than 1,350 packages have been finalised by an expert committee headed by Director General, Health Services and peer-reviewed by NITI Aayog.